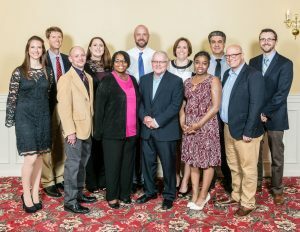 As a graduate of the program, you will help form a foundation of people who are uniquely qualified for the responsibilities of future community leadership. “Everyone can be great because anyone can serve. You do not have to have a college degree to serve. You do not even have to make your subject and verb agree to serve…You only need a heart full of grace, a soul generated by love.” – Martin Luther King, Jr.
Mark Burian, City of Kettering Police Dept. Lauren Mehling, Cheryl & Co.
Kyle Hoener, Shore To Shore Inc.
Courtney Schaeublin, FlexBank Administrators, Inc.
Laura Patzer, Reynolds & Reynolds Co.
Jason DeDario, Kettering Fire Dept., Fayette Recycling Inc.
Ashley Webb, CDC Distributors, Inc.
Celeste Hoegler, Dayton Progress Corp.